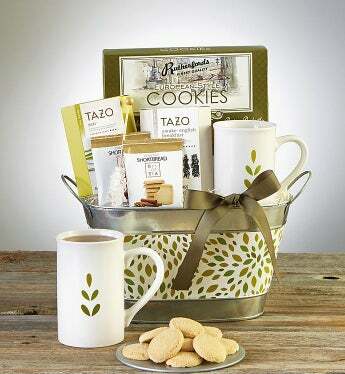 Invite someone special to brew away their worries with this smart and sophisticated tea, mug and sweets gift set featuring Tazo® Teas. Unique Biscottea® Chai Tea Flavored All Natural Shortbread, Eurostyle Biscuits, and Rock Candy Stir Sticks complement the distinctive teas from renowned Tazo®. Don't know the delivery address? Not sure what to send? Let the recipient pick the perfect gift!